The Cape Region’s country clubs are enjoying a long streak of successful golf tournaments this summer, boosted by the great weather. The Kings Creek Country Club Ladies Member-Guest Tournament, held June 27, used the theme “Flower Power” to add to the fun, with players dressing up and decorating their golf carts in the style of the swinging 60’s. Overall low gross honors went to the team of Ruth Lauver, Betty Minnucci, Ann Reed, and Judy Wetzel (152). Francis Brown, Beverly Bush, Patty Magee, and Anita Pettitt (119) came in first in the low net category. Putting Contest Winners were Member Marsh McLaurin (made) and Guest Lucia Geraci (4”). Anita Pettitt hit the longest drive on the second hole, and Kathy Tierney won the long drive on the tenth hole. The Kings Creek Country Club annual Senior Member-Guest tournament was held July 11, with 63 players participating. Stan Zabytko and his partner Norm Jester combined for a 69 to take the gross title. Nick Del Campo and his guest Jack Holloway shot a 56 to win net honors. The format was 1 better ball of partners. Rick Ashby was closest to the hole on the eighth, at ten feet two inches. Del Campo’s 23 foot eight inch approach won closest to the hole on the eleventh. The Kings Creek Country Club Ladies 18 Hole Golf League played Team Cha Cha on July 17. The format uses four-member teams, with each golfer playing her ball. 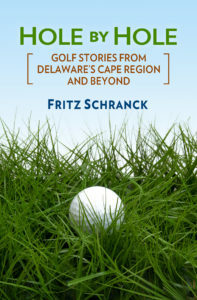 On the odd-numbered holes (cha), only the lowest score counts toward the team total. On the even-numbered holes (cha cha), the two lowest scores are used. Joanne Yurik, Jeannine Doane, Mary Mezger, and Linda Eicher took first place. Beth Magnus, Kathy Casey, Pattie Magee, and Prabhat Karapurkar finished in second. Third place honors went to Joan Crowley, Dorrie Spillman, Amy Micholas, and Ann Bailey. Kathy Casey won the closest to the pin contest on the eleventh hole, at 29 feet away. Rehoboth Beach Country Club hosted its 60th Men’s Member-Guest Tournament July 18 and 19, with 92 teams participating. The event began with a practice round on Thursday. It closed with an awards gala on Saturday night at the clubhouse, attended by more than 350 members and guests. “We couldn’t have had a better time and better turnout for this year’s tournament,” said Ed Perry, the club president. Club member Ed Brown of Lewes and his guest David Keck of Saucon Valley Country Club in Bethlehem, PA won the tournament with a first round score of 61 and a second round score of 64 for a two-day total of 125. Sussex Pines Country Club held its two-day club championships July 19 and 20. Dave Layfield finished as the men’s club champion, and Linda Townsend is the new ladies’ club champ. Oscar Pickenheim is this year’s men’s club gold tee champion. Scott Lanham won the Championship Flight, with Ronald Lewis winning first net in that category and Blasé Gavlich the second gross winner. John Sadowski took first place gross in the first flight, with John Terranova in second. Scott Baker was first net winner in that flight, followed by David Quinn for second. Among the gold tee players, Ed Basara won the gross category in the flight. Sonny Macklin took first net, with Ted Hagy in second. Among the ladies, Brenda Lewes took first place net in the championship flight. Madelyn Macklin won first place gross in the first flight, while Sandy Harrison was first net winner. The Kings Creek Ladies 9 Hole bunch had a shamble-format event July 21. Carolyn Ortwein, Sue Spence, and Noreen Buzerak won first place, while the team of Sue Eisenbrey, Carol Ellison, and Susie Shevock took second. Ortwein put her shot only 9 inches away to win the closest to the pin contest. The Sussex Pines Ladies had a best select drive tournament July 22. First place went to the team of Brenda Lewis and Bea Hylbert. Darlene Selewach and Carol Love took second, and Kathy Hudak and Barb Willin combined for third.